For other uses, see Franc (disambiguation). The franc was originally a French gold coin of 3.87 g minted in 1360 on the occasion of the release of King John II ("the good"), held by the English since his capture at the Battle of Poitiers four years earlier. It was equivalent to one livre tournois (Tours pound). The French franc was the name of a gold coin issued in France from 1360 until 1380, then a silver coin issued between 1575 and 1641. The franc finally became the national currency from 1795 until 1999 (franc coins and notes were legal tender until 2002). Though abolished as a legal coin by Louis XIII in 1641 in favor of the gold louis and silver écu, the term franc continued to be used in common parlance for the livre tournois. 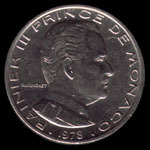 The franc was also minted for many of the former French colonies, such as Morocco, Algeria, French West Africa, and others. Today, after independence, many of these countries continue to use the franc as their standard denomination. The value of the French franc was locked to the euro at 1 euro = 6.55957 FRF on 31 December 1998, and after the introduction of the euro notes and coins, ceased to be legal tender after 28 February 2002, although they were still exchangeable at banks until 19 February 2012. Fourteen African countries use the franc CFA (in west Africa, Communauté financière africaine; in equatorial Africa, Coopération financière en Afrique centrale), originally (1945) worth 1.7 French francs and then from 1948, 2 francs (from 1960: 0.02 new franc) but after January 1994 worth only 0.01 French franc. Therefore, from January 1999, 1 CFA franc is equivalent to €0.00152449. A separate (franc CFP) circulates in France's Pacific territories, worth €0.0084 (formerly 0.055 French franc). In 1981, The Comoros established an arrangement with the French government similar to that of the CFA franc. Originally, 50 Comorian francs were worth 1 French franc. In January 1994, the rate was changed to 75 Comorian francs to the French franc. Since 1999, the currency has been pegged to the euro. The conquest of most of western Europe by Revolutionary and Napoleonic France led to the franc's wide circulation. Following independence from the Kingdom of the Netherlands, the new Kingdom of Belgium in 1832 adopted its own Belgian franc, equivalent to the French one, followed by Luxembourg adopting the Luxembourgish franc in 1848 and Switzerland in 1850. Newly unified Italy adopted the lira on a similar basis in 1862. In 1865, France, Belgium, Switzerland and Italy created the Latin Monetary Union (to be joined by Spain and Greece in 1868): each would possess a national currency unit (franc, lira, peseta, drachma) worth 4.5 g of silver or 6996290322000000000♠0.290322 g of gold (fine), all freely exchangeable at a rate of 1:1. In the 1870s the gold value was made the fixed standard, a situation which was to continue until 1914. In 1926 Belgium as well as France experienced depreciation and an abrupt collapse of confidence, leading to the introduction of a new gold currency for international transactions, the belga of 5 francs, and the country's withdrawal from the monetary union, which ceased to exist at the end of the year. The 1921 monetary union of Belgium and Luxembourg survived, however, forming the basis for full economic union in 1932. Like the French franc, the Belgo-Luxemburgish franc ceased to exist on 1 January 1999, when it became fixed at 1 EUR = 40.3399 BEF/LUF, thus a franc was worth €0.024789. Old franc coins and notes lost their legal tender status on 28 February 2002. The equivalent name of the Belgian franc in Dutch, Belgium's other official language, was Belgische Frank. As mentioned before, in Luxembourg the franc was called Frang (plural Frangen). The Swiss franc (ISO code: CHF or 756), which appreciated significantly against the new European currency from April to September 2000, remains one of the world's strongest currencies, worth today around five-sixths of a euro. The Swiss franc is used in Switzerland and in Liechtenstein. Liechtenstein retains the ability to mint its own currency, the Liechtenstein franc, which it does from time to time for commemorative or emergency purposes. The name of the country "Swiss Confederation" is found on some of the coins in Latin (Confoederatio Helvetica), as Switzerland has four official languages, all of which are used on the notes. The denomination is abbreviated "Fr." on the coins which is the abbreviation in all four languages. The Saar franc, linked at par to the French franc, was introduced in the Saar Protectorate in 1948. On 1 January 1957, the territory joined the Federal Republic of Germany, nevertheless, in its new member state of Saarland, the Saar franc continued to be the currency until 6 July 1959. The name of the Saar franc in German, the main official language in the Protectorate, was Franken. Coins displaying German inscriptions and the coat of arms of the Protectorate were circulated and used together with French francs. As banknotes, only French franc bills existed. Algeria: The Algerian franc was replaced with the Algerian dinar in 1964. Andorra: The French franc and the Spanish peseta were replaced by the euro in 2002. Belgium: The Belgian franc was replaced by the euro in 2002. France and some of its Overseas collectivities: The French franc was replaced by the euro in 2002. Luxembourg: The Luxembourgish franc was replaced by the euro in 2002. Madagascar: The Malagasy franc was replaced by the Malagasy ariary in 2005. Mauritania: The CFA franc was replaced by the Mauritanian ouguiya in 1973. Monaco: The French franc was replaced by the euro in 2002. Morocco: The Moroccan franc was eventually replaced by the Moroccan dirham in 1960. Saar: The Saar franc was used from November 20, 1947 to July 6, 1959. It was replaced by the Deutsche Mark on July 7, 1959. Tunisia: The Tunisian franc was replaced by the Tunisian dinar in 1958. The Latverian franc is the currency of the fictional country of Latveria. This page was last edited on 30 November 2018, at 18:59 (UTC).